Your company, business, group or organisation may organise events to bring together your community. Seeing as social media can be used to share information amongst your network and community – today we are going to look at the best practices for integrating social media into the events you organise. In fact you may already be doing this – I am seeing lots of event use Twitter and Facebook to build interactivity into their event. For those not yet trying this, we will give you some helpful info to get started. To give your event an initial boost and to keep everything (and everyone) organised – have an event specific email list. This means build and email list just for emailing people who are interested in coming along to your event. This is good for reminding everyone when/where/ what time etc. This may be an obvious one, but give the event good promotion through your company social networking accounts – mainly your Facebook fanpage and Twitter account. If you can get other businesses or people coming along to share your message and retweet you – then this is a positive start. This lets people chip into the conversation before and after the event. It’s also a great way for people to listen in and see what’s being discussed who can’t actually attend the event in person. When you get to your event kick off the social networking by a check-in to Foursquare (and sharing the check-in on Twitter and Facebook). This will let your network know where you are and why. Also encourage your attendees to do the same so they can spread the message of your event to their network. This clearly has the potential to add significant reach to the number of people finding out about your event. Even if they can’t attend they can listen in and comment to the hashtag. Towards the end of the event you may have questions and answer time. Sometimes at events the audience is very shy and hard to get questions out of them – awkward moment! Let the audience know you can ask a question via Twitter, or add a comment to your company Facebook page. You may find you’ll get more questions – and better ones as we aren’t so shy to send a tweet/ FB comment. If possible, video record all or parts of the event. Building up your companies video content is a good way to get a jump on your competition. Video is still growing strong posting this sort of content on your site will definitely draw in visitors. After the event write a blog post or article summarising the event and all the comments from Twitter, Facebook etc. You have just gone to the effort of organising an event so now is the time to collate all the information, put it together and send it out to your audience. This is a great way to get some post event buzz and provide some unique and fresh content to your audience. 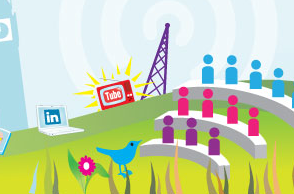 What are the benefits of integrating social media into your event? You will be able to keep and record the dialogue and information of the event, which you can later use in a content piece. We hope you find these tips useful and next time you are holding an event – consider incorporating social media to get more people coming along and interacting.